The trouble with boys is that they often get the raw end of the deal when you're trying to shop for age-appropriate "cute" stuff. I run into this when trying to buy outfits for special occasions, fabrics for clothing and decor, party ware, favors, etc. There is always an abundance of girly things available, but not so much for boys. I usually end up making something for them. Maybe I'm too picky, but I just don't want to do movie and cartoon characters for themes all the time. It seems that once they're out of baby/toddler stuff your choices become very limited. What happened to cute and fun? Ya know? Is anyone else with me? My current holiday dilemma is Valentine's Day. A lot of the things I've seen on the market for Valentine's Day are a tad too cheesy, especially for a 9 year-old. Unless you go the licensed character route, everything you see is plastered in hearts, pink and red, and frilly. As with any holiday, I like homemade better so I made the boys something to hand out and wanted to share it with you. Here is a free Valentine's Printable for all you boy moms out there. Go here to download. Print on card stock and cut. These cards will fit size A2 envelopes or you can punch holes and tie them to a favor. 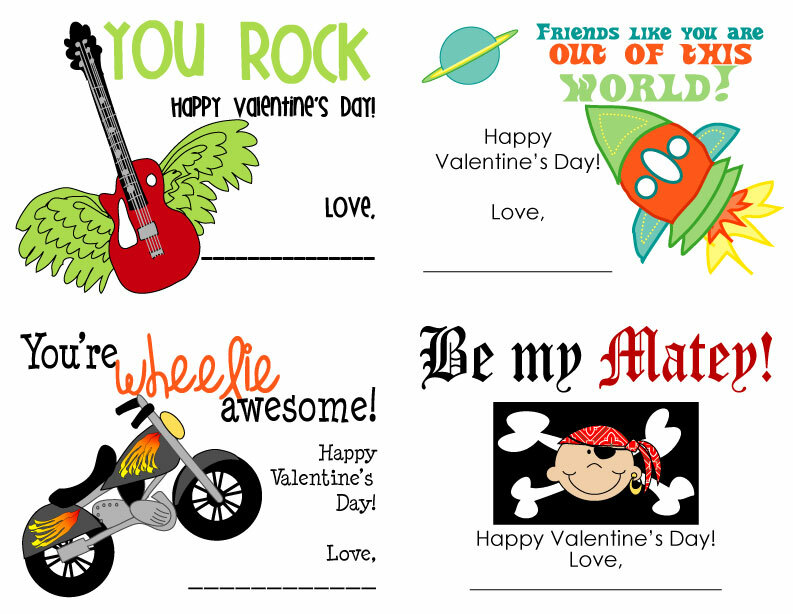 Let me know if you have a custom design in mind for Valentine's Day. There's still time for me to whip it up! love, love, love!!!!! thank you so much...this boys' mama is very happy! Thx, Marie! I'm glad you likey!! Love it too CTBaker In the Acres.. ur cuz..